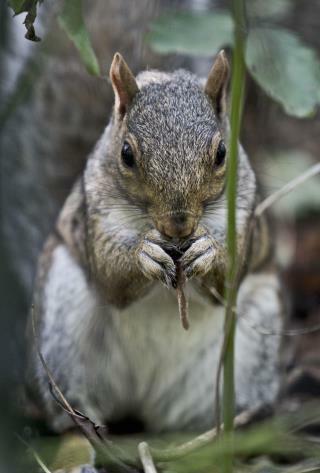 (Newser) – A 61-year-old who experienced a severe cognitive decline before his death may have had squirrel brains to blame. A new report on the 2015 death in Rochester, New York, finds that he may have suffered from variant Creutzfeldt-Jakob disease (vCJD), a rare brain condition you've likely heard of as "mad cow disease." That's what it's called when it's tied to consumption of contaminated beef, but in this case, doctors suspect a different culprit. The man was a hunter, and it was reported that he had eaten squirrel brains, though it's not clear whether he ate an entire brain or just squirrel meat contaminated with brains. He was brought to the hospital after losing touch with reality and losing the ability to walk on his own, LiveScience reports. An MRI found that his brain scan looked similar to those seen in vCJD sufferers. Who would eat squirrel brains? These prions are a major worry to those in the science community studying them. Many acre of land has been seized and quarantined indefinitely by the Canadian govt already when animals were found infected. Could turn us all into corpses or vegetarians some day. didnt read the article just assumed it was the trump boys when i read "squirrel brains" they must have shot someone.just like cheney. oh republicans is their anyone you wont kill?